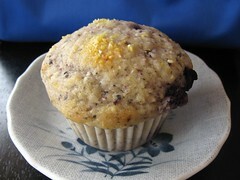 Blue Cornmeal Muffins with Blueberries - Do You Know The Muffin Man? Notes: I didn't have any sour cream so I used buttermilk with additional butter and flour. This turned out to be a mistake as the muffins had a pronounced buttery flavour. I also used sea salt instead of table salt and they were too salty. Tsk tsk, I know better than to make substitutions and measure sloppily. The yield is only 6 muffins so this could be easily doubled as it's not very much work. Good cornmeal flavour.